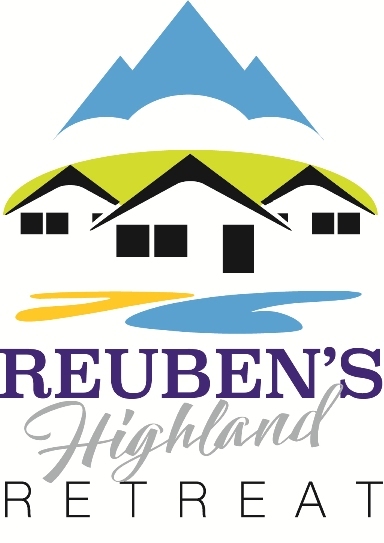 I’ve decided to keep a record of my adventures at Reuben’s Highland Retreat. Below you will find some stories about the things I have done and the places I have visited while staying at the lodges. I’ll add more in the weeks and months to come so remember to check in on me again. Why don’t you follow in my footsteps when you visit! 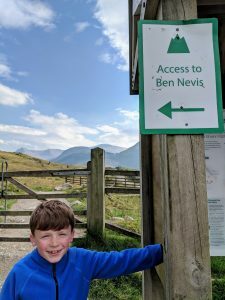 We travelled to Fort William today to take on Ben Nevis. We drove to the Ben Nevis Inn and Bunkhouse which is near a farm just above the River Nevis and set off on our climb. We didn’t actually plan to climb all the way to the top of the mountain but my mum and dad have promised to take me back on another clear day to see if we can make it to the summit. My dad says I need to keep practicing in the mean time though as he says it’s very steep when you get high up!! 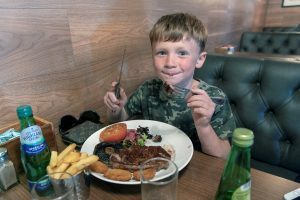 Whenever we eat out I always want to go to The Clachain in Mallaig, it’s my favourite! While we are waiting for our food to arrive I always get to play darts with my dad. He says the adding up is good for my brain!! After dinner we usually play a game of pool. I’m never there late enough to see the band but I often see the musicians setting up their instruments. We usually sit in a booth at the back but they have a big log fire which is always really hot. So today we went on the ferry to Skye then drove over the Skye Bridge to visit Eilean Donan Castle. I saw it on the TV and when my mum and dad told me it was near the lodges I said I wanted to visit. 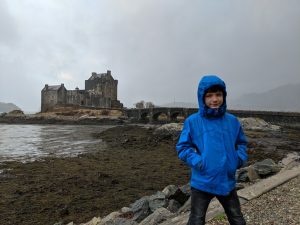 The weather wasn’t great but the castle is really spooky and we were allowed to walk round the island and climb the rocks down to the water. Sea kayaking is great fun! 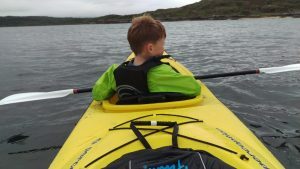 Mum, Dad and I had a go at sea kayaking with the guys who operate from the sea front next to the hotel in Arisaig. We got dressed in the full waterproof gear with life jackets before we jumped in the minibus and drove for 5 minutes down the coast to a quiet beach away from the harbour. There was another family with us in the bus and they joined our group for the paddle out to the Skerries which are the small islands just off the coast which shelter the harbour from the open sea. We stopped on a couple of the islands and were able to get out the kayaks are explore the rock pools and shallow water where I saw a real live orange star fish! I really enjoyed the trip and I’m looking forward to my next adventure.